“Les soldes” – sale season in France is highly regulated. French shops can have special promotions, but it’s not the same. During “les soldes”, shops are allowed to sell at a loss, in order to sell their stock, and that is why you get such incredible values. 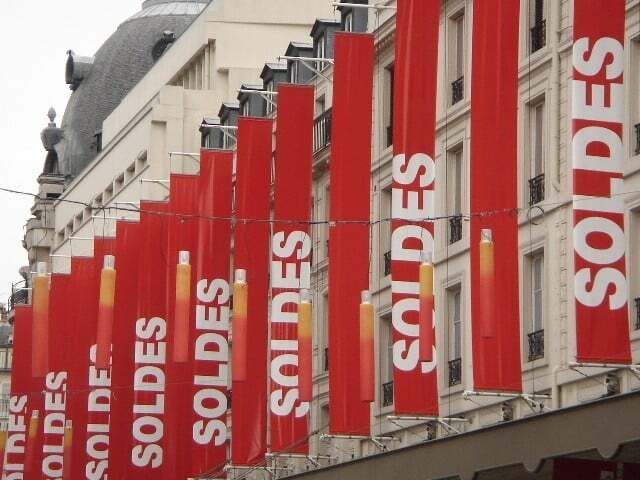 “Les Soldes”, the French Season’s Sales, only take place twice a year in France. They both last for five weeks, and discounts keep increasing during that time. There are huge bargains to be made. If you are looking into buying a bulky and expensive item in a small store (une boutique), don’t hesitate to ask for an even larger discount, or free delivery… Shops are trying to get rid of their inventories, and since they are by law allowed to sell at a loss… Well the sky’s the limit to the discount you could get! Watch out that in France, in most stores but this is especially true during the sales period, the merchandise is sold “ni repris, ni échangé” : “no return, no exchange”: meaning of course no refund! 2 – What Gender are “les Soldes” – Feminine or Masculine? Les soldes = sales – masculine plural – (as discounted items) – but it’s a common mistake to think it’s feminine. It’s important to know for your French adjective agreement. Say : des soldes exceptionnels (not des soldes exceptionnelles). “La solde” (feminine) is the payment for soldier. Faire les magasins = to shop. In Canada, they say “magasiner”, but not in France. If you liked this article, I suggest you read my article about Black Friday in France.